We’ve raised a ton of money so far, but you can still donate here. For those of you who have donated already, thanks! If you use Telerik software, why not tell the world how much by voting for the 2010 DevProConnections Community Choice Awards. Voting is open now and Telerik is nominated in 16 of the total 26 categories! While it’s great to take home awards like our recent Best of TechEd 2010 trophy, there is something unique about letting the voters on the Interwebs determine your fate. What do you need to do? Vote today! Fairfield / Westchester Code Camp 4 - Call For Speakers! On Saturday, November 6th, 2010, from 8:00 AM until 6:00 PM, the Fairfield / Westchester developer community will be holding their 4th annual Code Camp! The event will be hosted by CITI, a unit of The University of Connecticut School of Business, on the Stamford, CT Campus. The continuing goal of the Code Camps series is to provide an intensive developer-to-developer learning experience that is fun and technically stimulating. The primary focus is on delivering programming information and sample code that can be put to practical use. The event is free. This is an event by the developer community, for the developer community. The content is original and developed by you. Let's work together to make this event a success. To apply for a speaking slot, please first register as a speaker here: http://bit.ly/fwccspeaker. Then, with the email address you registered with on the speaker page, please add as many abstracts as you’d like here: http://bit.ly/fwccsession. Submit on anything you’d like related to .NET development. You must register athttps://www.clicktoattend.com/invitation.aspx?code=149443 in order to be admitted to the building and attend. Everyone knows that they should be writing better test cases for their applications, but how many of us really do it? In Visual Studio unit testing is an integrated part of the development environment. So there is no longer any reason to avoid not doing test driven development and automated unit testing. In this seminar you will learn how to architect your applications to make testing quicker and easier. You will learn to use the tools in Visual Studio to help you do the testing. 3. Using the Visual Studio Unit Testing tools. Paul D. Sheriff is the President of PDSA, Inc. (www.pdsa.com), a Microsoft Partner in Southern California. Paul acts as the Microsoft Regional Director for Southern California assisting the local Microsoft offices with several of their events each year and being an evangalist for them. Paul has authored literally hundreds of books, webcasts, videos and articles on .NET, WPF, Silverlight and SQL Server. Paul can be reached via email at PSheriff@pdsa.com. Check out Paul's new code generator 'Haystack' at www.CodeHaystack.com. N/R/W to 49th St./7th Ave. In Part I we looked at the advantages of building a data warehouse independent of cubes/a BI system and in Part II we looked at how to architect a data warehouse’s table schema. In Part III, we looked at where to put the data warehouse tables. In Part IV, we are going to look at how to populate those tables and keep them in sync with your OLTP system. Today, our last part in this series, we will take a quick look at the benefits of building the data warehouse before we need it for cubes and BI by exploring our reporting and other options. As I said in Part I, you should plan on building your data warehouse when you architect your system up front. Doing so gives you a platform for building reports, or even application such as web sites off the aggregated data. As I mentioned in Part II, it is much easier to build a query and a report against the rolled up table than the OLTP tables. 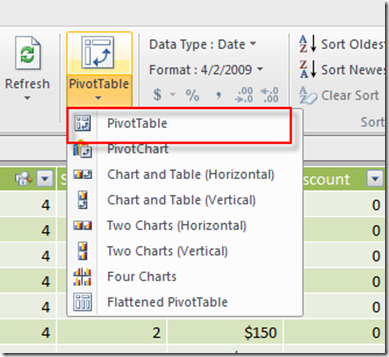 To demonstrate, I will make a quick Pivot Table using SQL Server 2008 R2 PowerPivot for Excel (or just PowerPivot for short!). 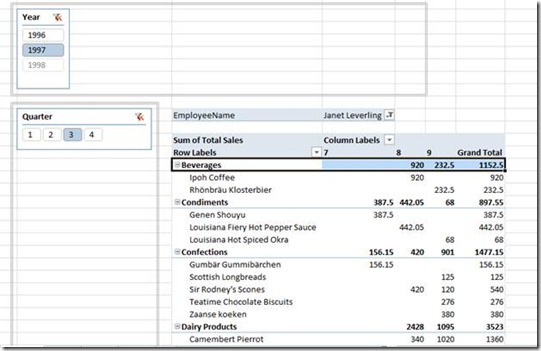 I have showed how to use PowerPivot before on this blog, however, I usually was going against a SQL Server table, SQL Azure table, or an OData feed. Today we will use a SQL Server table, but rather than build a PowerPivot against the OLTP data of Northwind, we will use our new rolled up Fact table. To get started, I will open up PowerPivot and import data from the data warehouse I created in Part II. I will pull in the Time, Employee, and Product dimension tables as well as the Fact table. Once the data is loaded into PowerPivot, I am going to launch a new PivotTable. PowerPivot understands the relationships between the dimension and fact tables and places the tables in the designed shown below. I am going to drag some fields into the boxes on the PowerPivot designer to build a powerful and interactive Pivot Table. For rows I will choose the category and product hierarchy and sum on the total sales. I’ll make the columns (or pivot on this field) the month from the Time dimension to get a sum of sales by category/product by month. I will also drag in Year and Quarter in my vertical and horizontal slicers for interactive filtering. Lastly I will place the Employee field in the Report Filter pane, giving the user the ability to filter by employee. The results look like this, I am dynamically filtering by 1997, third quarter and employee name Janet Leverling. I hope you have enjoyed this series, enjoy your data warehousing. In Part I we looked at the advantages of building a data warehouse independent of cubes/a BI system and in Part II we looked at how to architect a data warehouse’s table schema. In Part III, we looked at where to put the data warehouse tables. Today we are going to look at how to populate those tables and keep them in sync with your OLTP system. No matter where your data warehouse is located, the biggest challenge with a data warehouse, especially one where you are going to do real time reporting off of, is that the data is published from the transactional system (OLTP). By definition, the data warehouse is out of date compared to the OLTP system. Usually when you ask the boss, “How much latency can you accept between the OLTP and data warehouse systems” the boss will reply: none. While that is impossible, the more time to develop and the more money you have will to develop said system, the closer to real time you can get. Always bring up the American Express example used in Part I for proof that your system can accept at least some latency. If you remember the code examples from Part II, most of the time you have to query OLTP data, aggregate it, and then load it into your new schema. This is known as the process of extraction, transformation, and loading (ETL) data from the OLTP system into the data warehouse. The workflow usually goes like this: at a pre-set time (at every change, hourly, nightly, or weekly) query the OLTP data (extraction) and then aggregate and flatten it out (transformation) and then copy the transformed data to the data warehouse (star or snowflake) tables (load). When you have a long time series to publish your data, say nightly, or weekly, you can do a direct database dump. The process would be pretty straightforward. At a regular interval (or manually) a process would start that would query the OLTP database and perform all of the aggregations, etc and then load it into a staging data warehouse database, then wipe out the production data warehouse and load the data in. Another option is to use an ETL tool. A good example is SQL Server Integration Services (SSIS) if you are using Microsoft SQL Server. (Actually SSIS will work with multiple database, you just need a SQL Server host.) A modern ETL tool will give you the ability to segment the work into logical groups, have a control flow based on success and failure of a condition, and allows rollbacks. A typical workflow with an ETL tool is that the ETL will run on a schedule (or based on a condition, such as a message arriving from a queue or a record written to a admin table) and have a parameter(s) passed to it. This parameter is usually a time series and the ETL will perform all of the extraction on data from the OLTP database filtered by that parameter. An ETL tool is the most likely solution you will employ, especially if you have to make frequent updates from your OLTP system to your data warehouse. Another option is to use database triggers. For those of you that don’t know a lot about triggers, well they can lead to evil. ;) That said, they are events that fire when data changes. You can then write SQL code to run when the data changes, even ETL code. Triggers are hard to debug and difficult to maintain, so I would only suggest that you use a trigger when you need “real time” updates to your data warehouse and even then, the trigger should only write a record into an admin table that your ETL process is polling to get started. A common design pattern with a sophisticated ETL is to do all of the ETL to a staging data warehouse and allow a check mechanism to verify that the ETL was successful. Once this check is performed (either by computer or by human, depending on the system), you can then push the data from the staging tables to the production tables. 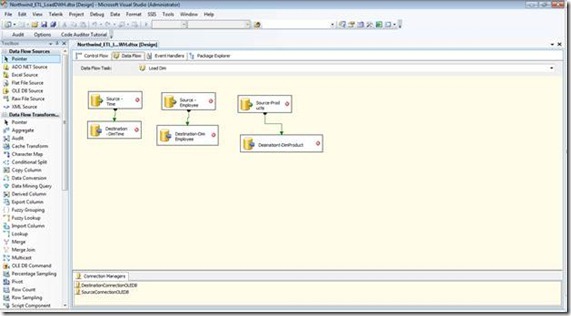 There is a SQL operator specifically for this process, the MERGE operator. MERGE looks at two tables and looks at their joins and compares the data and will do add, updates, inserts, and deletes to keep the two tables in sync. Here is how we would do that with a MERGE statement and our fact table from Part II. s.ShipperID, s.[Total Sales], s.Discount, s.[Unit Sales], s.[TimeKey]);--required!! Tomorrow we will warp up with the application development options. In Part I we looked at the advantages of building a data warehouse independent of cubes/a BI system and in Part II we looked at how to architect a data warehouse’s table schema. 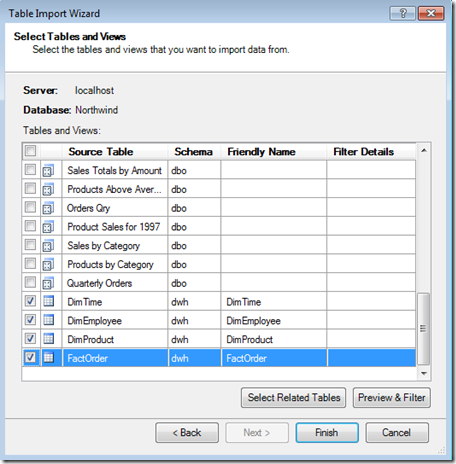 Today we are going to look at where to put your data warehouse tables. When you bring a new system online, or start a new BI effort, to keep things simple you can put your data warehouse tables inside of your OLTP database, just segregated from the other tables. You can do this a variety of ways, most easily is using a database schema (ie dbo), I usually use dwh as the schema. This way it is easy for your application to access these tables as well as fill them and keep them in sync. The advantage of this is that your data warehouse and OLTP system is self-contained and it is easy to keep the systems in sync. As your data warehouse grows, you may want to isolate your data warehouse further and move it to its own database. This will add a small amount of complexity to the load and synchronization, however, moving the data warehouse tables to their own table brings some benefits that make the move worth it. The benefits include implementing a separate security scheme. This is also very helpful if your OLTP database scheme locks down all of the tables and will not allow SELECT access and you don’t want to create new users and roles just for the data warehouse. In addition, you can implement a separate backup and maintenance plan, not having your date warehouse tables, which tend to be larger, slow down your OLTP backup (and potential restore!). If you only load data at night, you can even make the data warehouse database read only. Lastly, while minor, you will have less table clutter, making it easier to work with. Once you move your data warehouse to its own database or its own database server, you can also start to replicate the data warehouse. For example, let’s say that you have an OLTP that works worldwide but you have management in offices in different parts of the world. You can reduce network traffic by having all reporting (and what else do managers do??) run on a local network against a local data warehouse. This only works if you don’t have to update the date warehouse more than a few times a day. Where you put your data warehouse is important, I suggest that you start small and work your way up as the needs dictate.